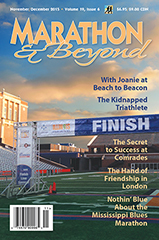 Marathon & Beyond magazine welcomes Meghan Hicks, the newest member of our M&B family. An accomplished trail runner, Meghan will be writing the “On the Trail” column. Meghan is a Park City, Utah-based trail runner and writer. She is also the Senior Editor at iRunFar.com and a contributing editor at Trail Runner magazine. Meghan ran track in high school and at a Division III college, then spent her early and mid-twenties road running. She ran her first ultramarathon in 2006 and hasn’t looked back from trail running. While Meghan has podium-ed at the Marathon des Sables, The Coastal Challenge, the Grand Teton Trail Marathon, and a number of other trail and ultra-distance races, she’s more of a top 10%-type runner and considers those finishes her lucky days. She loves using running to adventure within the world’s wildest places.